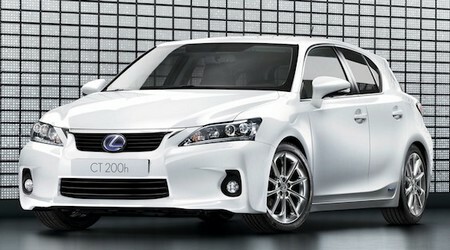 The 2011 Lexus CT 200h is a machine built to impress, simple as that. Its power to please is derived from three key concepts woven together into one deluxe sport-luxury crossover: engine power, tech features, and an eco-friendly hybrid car. As soon as the driver sits down, a host of options are available. An 8 inch LCD screen, which is touch operated, controls numerous tech features, such as navigation, interior car temperature, phone calls, and the premium six speaker audio system built into the car. The audio system comes with USB and media player jacks, Bluetooth options, and a 6 CD changer installed into the CT 200h’s main panel, and all of these features are controlled using buttons on the steering wheel. When in reverse, a camera in the back of the car sends the image to the LCD screen as well as a small screen built into the interior mirror for parking assistance. Further, the interior of the car uses biologically friendly materials, an example being bamboo framed speakers. Safety is another technological and important aspect of the CT 200h; multiple electronic systems come with the vehicle, such as several electronic breaking systems, a radar system that warns of approaching vehicles while in cruise control, electronically monitored stability to prevent rollovers, and a system which anticipates collision in order to mitigate damage and injury. The Lexus CT 200h also offers a unique driving experience. Within three distinct driving modes (sport, eco, EV, or normal), you can choose between two driving styles, dynamic or relaxed. These styles offer different riding experiences to the driver, as well changing the color of the gauges from either red or blue depending on the style. The EV mode, which runs on electricity, doesn’t need gas assistance until the car reaches 23 mph, saving the driver a good amount on gas purchases. The engine puts out about 134 horsepower, while the gas mileage came out to about 37 mpg, a very impressive stat indeed. Overall, the 2011 Lexus CT 200h will give you an eye for green by being an environmentally friendly option that doesn’t sacrifice on performance or pricing, while making those who see you drive it go green with envy.